The CIRS Model 603A phantom is designed for the assessment of MR image distortion in Stereotactic Radiosurgery Planning. The tissue equivalent, anthropomorphic design provides the closest conditions to a clinical imaging scenario. The phantom can be imaged using X-ray, Computed Tomography and Magnetic Resonance. 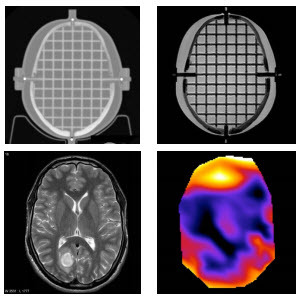 It images well with all MRI sequences tested to date, including T1 weighted, T2 weighted, MPRAGE and CISS. The phantom is also suitable for frame less SRS QA. The entire inter-cranial portion of the skull volume is filled with an orthogonal 3D grid of 3mm diameter rods spaced 15mm apart. Five extended axisrods intersect at the reference origin of the grid. The end of each extended axis is fitted with CT/MR markers allowing for accurate positioning with lasers and co-registration of CT and MR image sets. The 603A can also be utilized in CT/ MR image fusion studies.